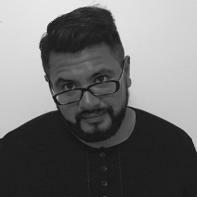 Ruben Rodriguez is a MFA student at the University of New Mexico where he studies poetry. He is the fiction editor of The Great American Lit Mag and author of the chapbook We Do What We Want (Orange Monkey Publishing, 2015). His poetry has been deemed fit for consumption by Passages North, Beecher’s, Forklift Ohio, Potomac Review, Bayou Magazine and others. You can find him at www.rubenstuff.com. Easter at Grandma Esther’s meant eggs buried in thorns. My cousin, too old to play pagan, hoaxed forbidden fruit in a lemon tree. His sourness born to the taste of brandy and fractured words. Fathers have nailed their sons to crosses and called it love. Mine, hustler overworked, chose sober to cherish his children by the hours. Carved an innocence out of tiger’s eye. But skin is skin, pudgy paw plunged to grab red dyed gift. Withdrawal poked at pain. Hand too big when holding promise. With each angle, new blood. Cousin shattered upon lawn in bitter laughter. Child carved from stone unwilling to let go. Little boy set to legs. Safety in the 80s relied on eyes. Soft toddler body sinking. Family pride > tragedy. Grandpa cowboy leapt in. Baby boy’s baby boy snatched from deep end. A formica table is the best place to remind big-little-boy he was loved from the outset. Mijo, I saw you and jumped in. Fully clothed. My boots and belt—big brass buckle. $216 bound tight in my billfold. When I lifted you from the water, you laughed. Like Achilles, dipped in death & chlorine. Baby boy wrapped in terrycloth, passed around the patio all afternoon. The traffic off Paramount hushed by grandma Esther’s pink cinderblock wall—rancheras thumping, chisme thick, tequila y carne in the air. Toddlers can’t hold onto towels. Wind laughs, Shiver child. Sunsets keep coming. And faster. Grandma Lopez revealed me pineapple. Only knew it from can. Prickled body’s curve, no match for experience. Skin shed like wet clothes. Knife to flesh always bleeds. Discovery—juice trickled off chin.